Our atmosphere is filling up with CO2 and we seem to be the major cause of that. The generally accepted solution seems to be cutting back on emissions as quickly as possible, but implementing such cuts is problematic because everyone has to agree to do more, which essentially ends up costing a lot of time and money. There is an alternative to such measures, though. Instead of relying entirely on cutting emissions, why don’t we start taking CO2 out of the atmosphere? That’s exactly what biochemist Pierre Calleja is trying to do, and his solution almost sounds too good to be true. Calleja has developed a lighting system that requires no electricity for power. 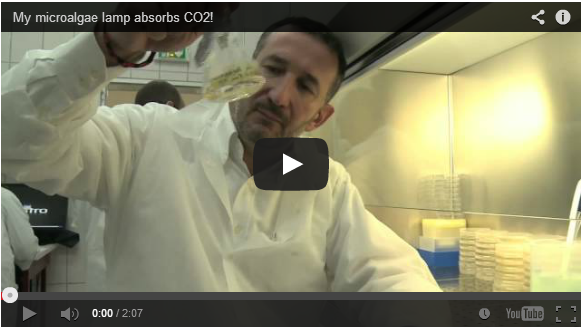 Instead it draws CO2 from the atmosphere and uses it to produce light as well as oxygen as a byproduct. The key ingredient to this eco-friendly light? Algae. Certain types of algae can feed off of organic carbon as well as sunlight, and in the process produce carbohydrate energy for themselves as well as oxygen as a waste product. 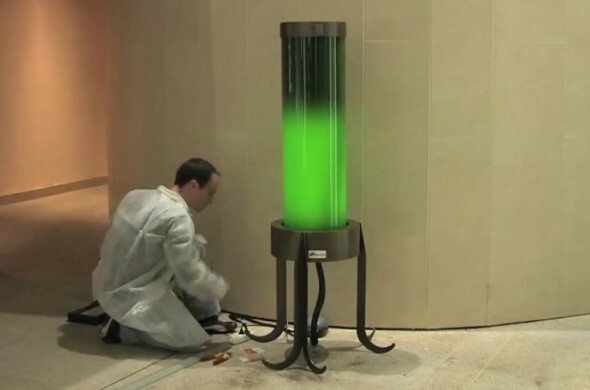 Cajella’s lamps consist of algae-filled water along with a light and battery system. During the day the algae produce energy from sunlight that is then stored in the batteries. Then at night the energy is used to power the light. However, as the algae can also produce energy from carbon, sunlight isn’t required for the process to work. That means such lights can be placed where there is no natural light and the air will effectively be cleaned on a daily basis. What isn’t discussed in the video is how much maintenance such a light needs. However, the good news is algae can also act as a biofuel once separated from the water, so even if the lights need a water change out every so often, the waste algae just forms another type of fuel where as the water can be recycled.